Be it the bustling OMR or the chaotic Mount Road …. Chennai roads abuzz with traffic – often you hear the siren of an ambulance – become anxious – good drivers immediately tend to take to left and stop their vehicle – most of the drivers on road react swiftly, try to give way for the ambulance to passby – some fools do try to drive fast after the ambulance too….but mostly, Chennaites are good at heart and can feel happy (though it in fact is a sad occasion) on something that happened in our own Chennai, well reported in Times of India of date…. I had earlier posted on the harrowing experience of the parents of AP Hithendran – trying to link to ‘Traffic’ - a 2011 Malayalam thriller film based on a real-life happening in Chennai……. There are sorrows and tearful happenings in life…. External appearances are deceptive…. One may never be able to understand the pain, frustration and suffering of fellow human beings. Some are made of stern material, strong mind ~ they hide their emotions and sufferings and mingle with those around….the sadness may be unfathomable ~ and we might hurt those people with our action unintentionally and without knowing their suffering by being harsh to them. If we understand that ‘life itself is short’ and we are gifted to be joyous – every little thing would give us happiness and make us treat those around with more dignity, warmth and affection. Saw Chennaiyil Oru Naal (English: A day in Chennai) telecast in TV. 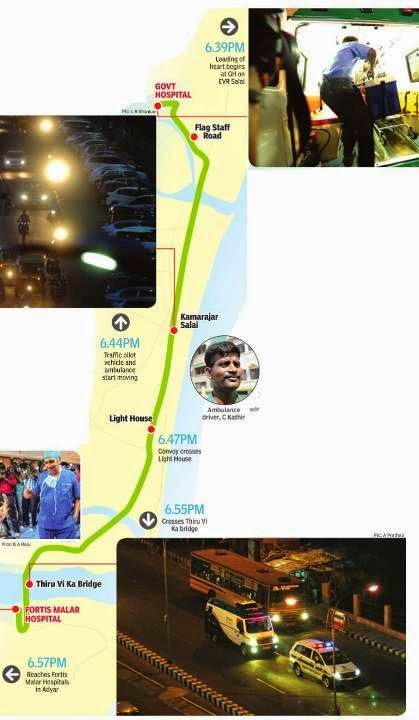 It was a remake of Traffic in a hyperlink format ~ a thriller that intertwines multiple stories around one particular incident, inspired from an actual event that happened in Chennai. It centered around the tragic accidental death of a youth, who is brain dead. The parents at the time of extreme sorrow decide to take him off the ventilator and donate their son's heart ~ but the recipient is far away in Vellore….. how it gets transported the 150 odd kilometers in a short time forms the theme. Sad to see and hear…. Imagine the plight of those who underwent such horrowing time. Police Create green corridor from General Hospital to Fortis Malar, Adyar. Normal life in the heart of the city came to a halt for a few minutes on Monday to save a life. In a textbook example of precise coordination between surgeons of two hospitals and the traffic police, a team transported a heart from the Government General Hospital to Fortis Malar Hospitals in Adyar, about 12km away , in less than 14 minutes by creating a `green corridor'. The ambulance carrying the heart, harvested from a 27-year-old man who died in a traffic accident and preserved in a special container at 4 degrees Celsius, started from GH at 6.44pm and reached Fortis Malar 13 minutes and 22 seconds later, at 6.57pm. A vehicle normally takes 45 minutes to cover the stretch during the peak hour. At the private hospital, the parents of Hvovi Minocherchomji, a 21-year-old BCom student from Mumbai, received the heart the mother in tears, the father with a prayer on his lips. Malar surgeons immediately started the transplant. The liver and the kidneys went to other hospitals. Malar got a call as early as 5.45am on Monday that a brain-dead patient may be taken off the ventilator in a few hours and that a heart, a liver and kidneys would be available for donation. The Mumbai woman turned out to be luckier than four others awaiting a heart transplant, as the donor's blood group and body weight matched only with hers. A human heart can be preserved for up to four hours, but experts say the earlier the transplant, the higher the chances of success. After the organ registry completed the formalities, it was for the traffic police to ensure a safe and speedy passage for the organ. C Kathir, a seasoned ambulance driver, was chosen for the mission. Deputy commissioner of police Sivanandan had 26 of his men in place at the 12 intersections the ambulance was to pass by . As the vehicle passed each signal -touching 100kmph at times -a pilot radioed in the location to the control room as also police teams along the corridor. Around 10.15pm, surgeons said, the heart started beating in the recipient's chest. “As soon as the heart was brought here, the transplant began. By 10.15pm, the heart was beating in Minocherchomji's chest,“ said Dr Suresh Rao, chief anesthetist at Fortis Malar. Additional commissioner of police (traffic) Karunasagar said the city traffic police had proved repeatedly its mettle in creating green corridors without affecting normal life on the roads. When a human heart was being loaded intoan ambulance at the General Hospital around 6.40pm on Monday , 6km away , at Light House, traffic inspector Uday Kumar's walkietalkie crackled to life. He had been preparing for this moment. The ambulance bearing the heart, harvested from a 27-year-old brain-dead man in GH and to be transplanted in a 21-year old woman in Fortis Malar Hospitals, Adyar, would pass by the intersection he was guarding, in three seconds. For this, he has been here for three hours. Like him, 25 other police officers were on duty to ensure that the harvested heart reached its destination to save a life by minimizing the transit period. And they did it in style--the organ traversed the 12km stretch in 13 minutes and 22 seconds, between 6.44pm and 6.57pm. A little more than three hours later, the heart started beating in the chest of Hvovi Minocherchomji. Surgeons at Malar declared the transplant a success. It was as difficult for the traffic police as it was for the surgeons to save this life. From the pilot vehicle, M Selvaraj, an inspector, kept frequently informing the control room about his location. “Field officers at all the 12 junctions received my messages through their walkie-talkies,“ he said. As the ambulance drew near, officers at each junction froze the traffic from other roads. Officers had to strike a balance between avoiding a traffic pile-up and ensuring the ambulance gets a free pas sage. “The ambulance could zip across comfortably at 80kmph, and at times it touched 100kmph. There were no traffic snarls. Our experience in forming green corridors worked to our advantage,“ said S Sivanandan, deputy commissioner (planning). The ambulance crossed 12 junctions with the help of 26 police officers. The team had a minor hiccup as they had to go against the flow of the traffic from the in-gate of GH to the signal. “We had to do this to avoid losing time by taking a U-turn. This was also done because holding the flow of pedestrians coming out of Chennai Central, on the opposite side of the road, would have been dif ficult,“ said Selvaraj. The change was made at the last minute. The traffic police created their first green corridor in 2009, when a heart had to be taken from Teynampet to Mogappair. “Back then, the heart was taken in a police vehicle,“ said Selvaraj. This time, a police vehicle went ahead of the ambulance to ensure the road was free of traffic and pedestrians. The traffic police are usually told two hours prior to the organ harvest. “While the convoy is on the move, all signals it crosses turn green. That's why the name green corridor,“ said Karunasagar, additional commissioner of police (traffic).